Although both Hill Top and the Beatrix Potter Gallery are now closed for the winter it doesn't mean we all put up our feet and take a rest. 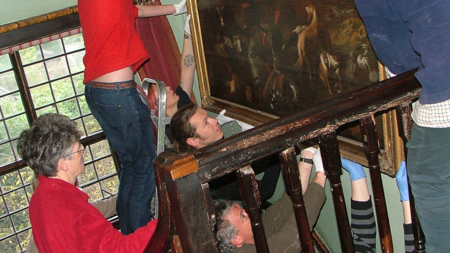 The winter months are when the hard work of deep conservation cleaning and any repair and restoration gets done. Here's one tricky job that needs a lot of teamwork if it's not going to end in disaster! how many staff does it take to move a painting!